Why We Love To Monkey Around! What is it about those certain restaurants/ eateries that compel you to keep heading back again and again? It’s almost like the thought dwells somewhere in your mind and when you are asked to suggest a place it automatically pops up. Monkey Bar is one such place that I am always up and ready to visit without a dramatic “again??”. So what earns Monkey Bar this special priviledge in my gastronomic mental map? The first point would be the interesting concept. It is true when people say that sometimes all it takes is a brilliant idea to make a difference. Mo Bar, I would say, definitely brought a change in the food scene in a pub set-up with their tempting menu (caramalised pork ribs, butterfly chicken, pork sorpotel in jam pots, brain cutlets, tiger beef, keema bao, galouti killer, tikki of joy, and the like) at a time when most other places in Bangalore were offering the same ole tried and tested classics. And the second point would be the vibe and the people, that heading back there feels like a homecoming each time. Too many memories! 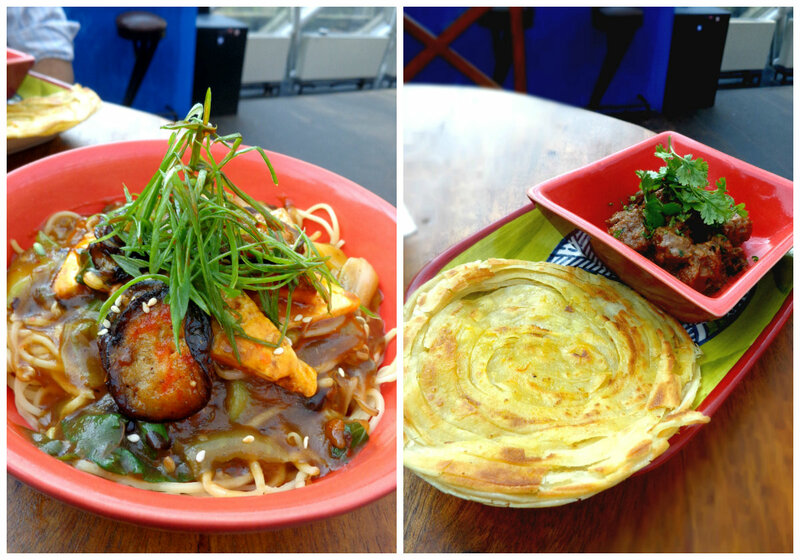 So during my recent trip to Delhi, I decided to ring in my b’day celebrations by feasting at Monkey Bar. The pyramid set-up housing two floors was quite a change from the cosy space that we are accustomed to at Bangalore. The décor remains familiar with quirky posters, graffiti, dreamy lights, and the sports corner with the foosball and pool table. For lunch, we chose the central deck close to the bar with the tall table and chairs to be right at the core of the monkey universe. 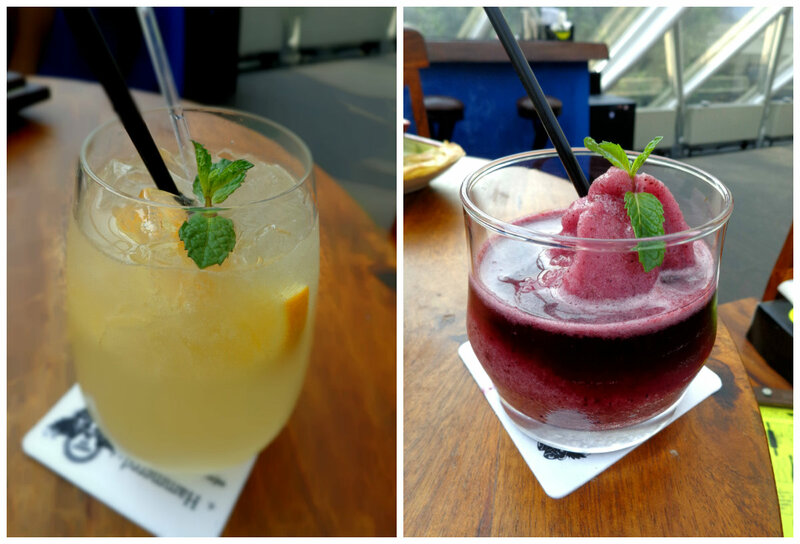 This time I was adamant in trying only the new inclusions in the menu, so starting with cocktails, we ordered Narangi, Ginger Rogers and Rum Rita. Narangi, a whisky based cocktail which derives its name from the local narangi oranges, was a bitter-sweet concoction with the two main ingredients effortlessly complementing each other. The Ginger Rogers was a shake-up of gin, ginger ale, peach syrup and mint, and proved to be a great fix for a chilly Delhi winter afternoon. Rum Rita, a spin on margarita, was a sweet frozen mix of rum, red wine and wild berry compote, and came looking pretty in dark pink. Ladies, better look out for this one! For munchies, we began with Pepper Chicken, (don’t picture the dark and spicy Indian version!) which had little chunks of chicken flash cooked with toasted schezwan pepper in soy and black pepper sauce and was topped with crushed peanuts. 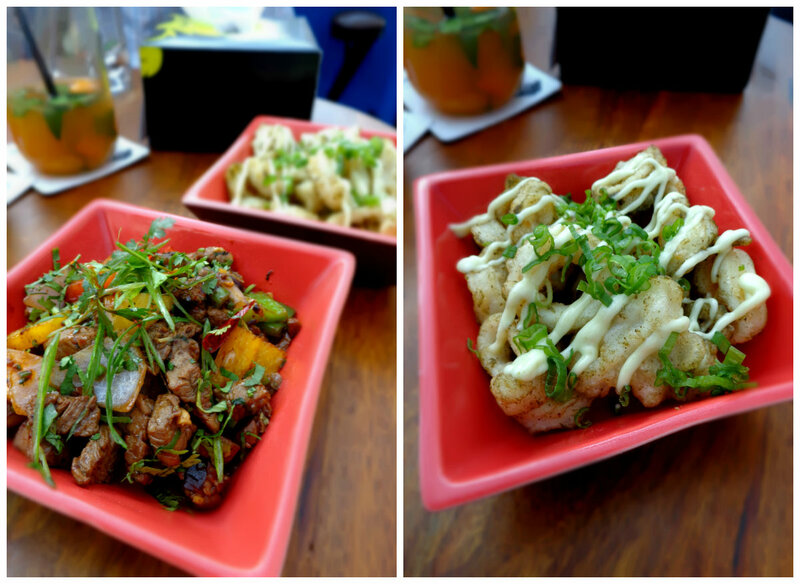 The simple Tempura Calamari was spiked in flavour with a green curry glaze and was served with wasabi mayonnaise. 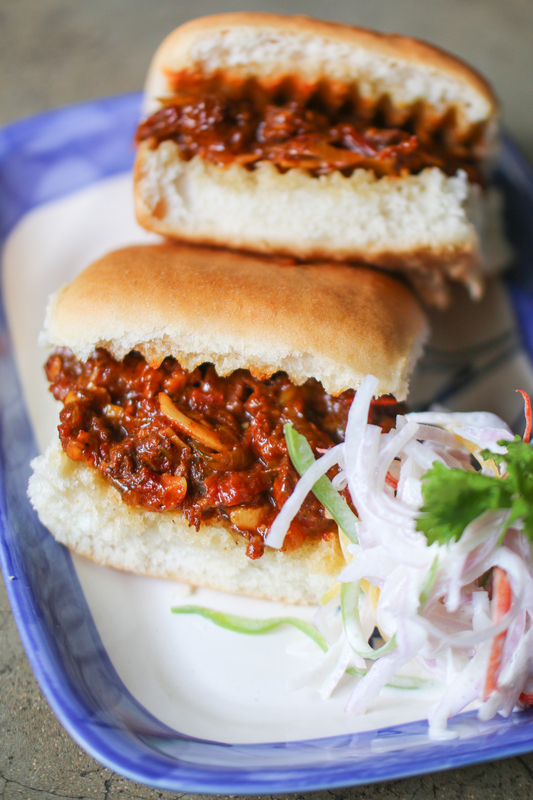 From the red meat section, the Steak Cubes in Black Bean Sauce was potent in spice level for me but I enjoyed the Asian flavours, while the Goan Chorizo Pao made me sit quiet and relish biting into chunks of smoked Goan sausages sauteed in a tomato based paste and stuffed into buttered bread. From the mains, since I had been craving for noodles, we ordered the Fried and Wok Tossed Japanese Eggplant and Paneer on a bed of soupy noodles. It was a nourishing dish brimming with the flavours of the fresh veggies. Then seeing Kosha Mangsho (which happens to be one of my most-loved dishes) on the menu, it was too tempting to give it a skip. And we went further and ordered the interesting sounding The Parsee Orderlies’ Mutton Curry too! The Bengali dish had cubes of meat, slow roasted in a rich curry with dominant flavours of cardamom, cinnamon and cloves, and was served with saffron glazed, crisp and flaky Kerala Parathas. However, I did wish there were mini luchis instead. The Parsee dish had slow cooked mutton ribs in a rich, creamy gravy topped with grated cheese and served with coconut and clove rice. A fitting meal indeed! But wait! 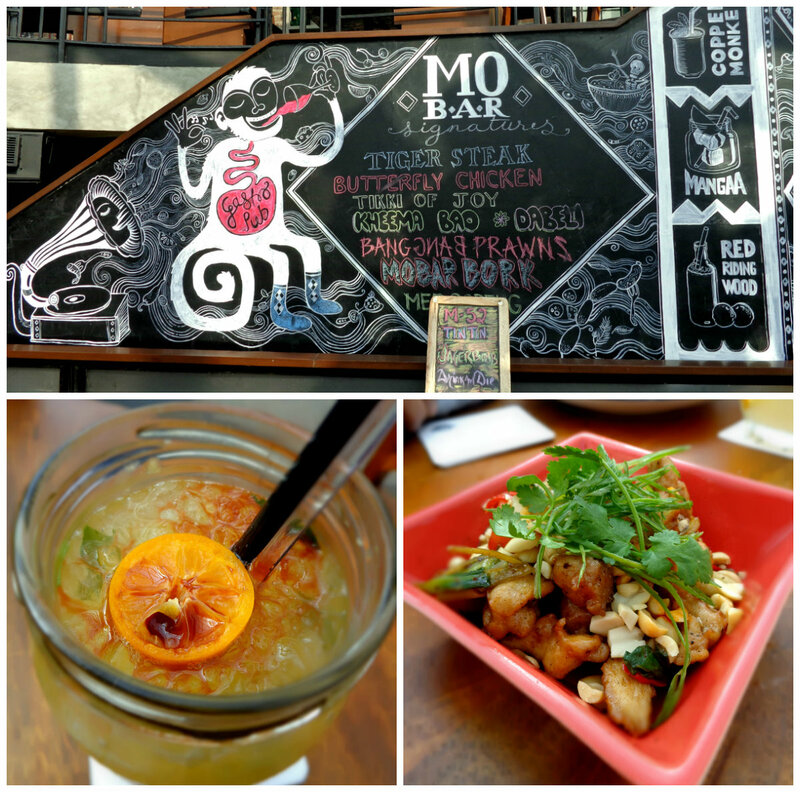 Being at Mo Bar and not ordering the burgers felt like we were doing it all wrong. 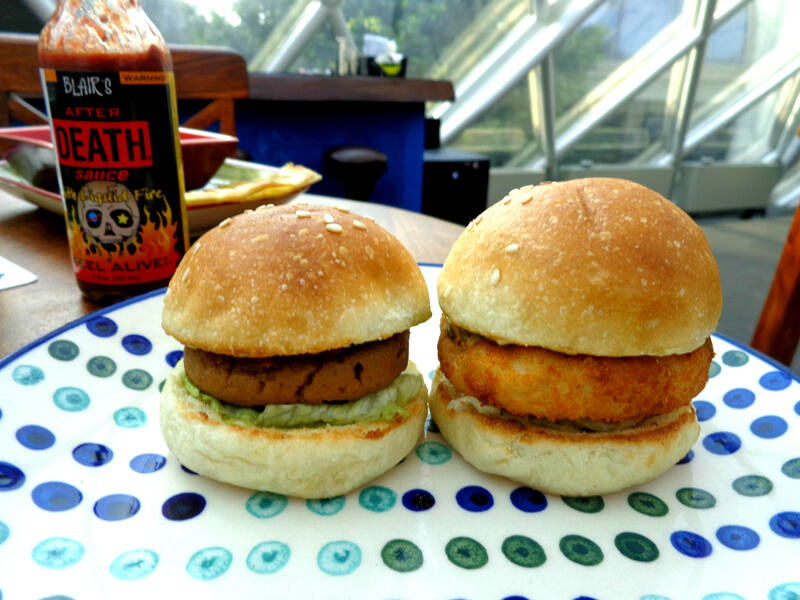 So we greedily and sheepishly ordered the popular Seafood Sliders (my No.1 at Mo Bar of late) and Shaami Sliders, which was moist mutton shaami kebabs stuffed in mini soft buns and smeared with homemade pudina chutney. And for a sweet ending, we indulged in Wild Berry Vacherin, a refreshing meringue based dessert topped with berry compote, fresh strawberries and pastry cream; and Chocolate Pot de Creme with Salted Caramel, which was a glass jar filled with chilled chocolate mousse and topped with salted caramel, and together it created a great medley of textures. There were also slices of lemon and poppy cake with olive oil to go along with it. 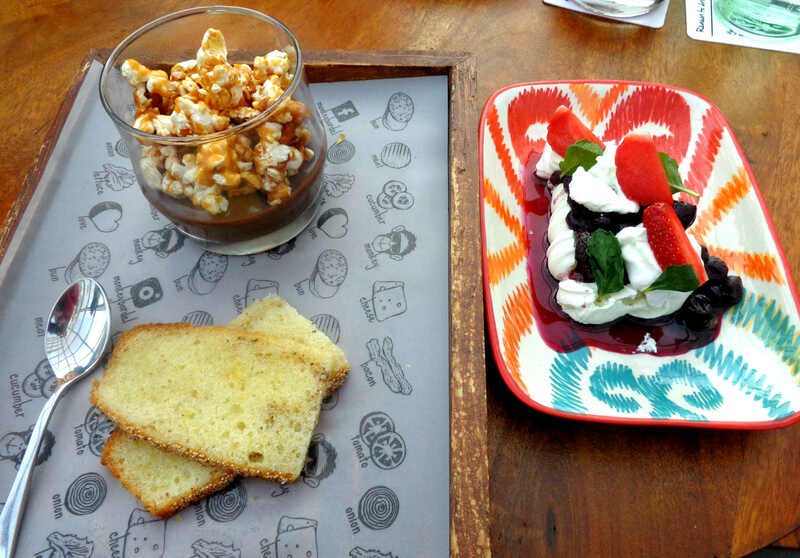 Though I wish Mo Bar remained exclusive to Bangalore but then again, good things must always be shared. So here’s wishing that the capital city learns to monkey around too. 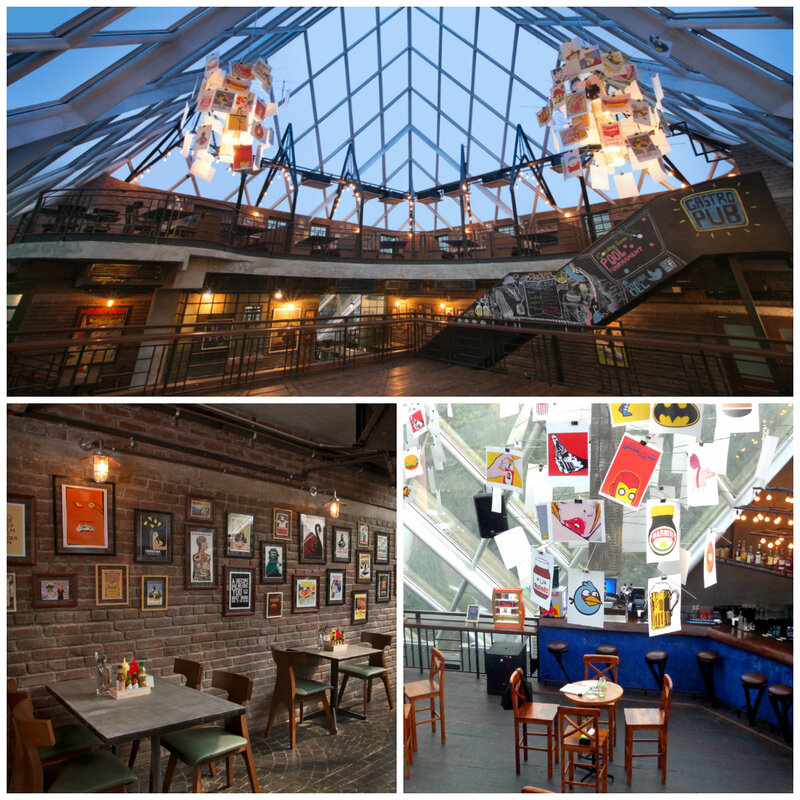 Been there twice, and now its my favourite place in the city already! Big up to the chief chef, he’s really creative, and the whole and soul of the place, Nikhil, (the manager, and more), who is a crazy party animal himself. Going there soon!